It's a 'radiant orchid' year! Happy Friday! Perhaps the most famous (or infamous) ritual of New Year's celebrations is the making of New Year's resolutions. After giving it a lot of thought, I've carefully pruned and shaped a list of five personal goals that should keep me on track and happy this year! Today I have, at long last, my five 'radiant resolutions' to share with you on this edition of Friday Five! Enjoy! I've had a fascination with flowers for as long as I can remember, and then some (remembered via family VHS!). Some of my fondest grade school memories involve picking out a few stems with my pocket money, whether it be at a farmer's market or a local shop. Fast forward to last year - I acquired a few orchid plants for the very first time! It's been a joy caring for them and getting them to flower again. Seeing as 'radiant orchid' is the color of the year, I can't think of a better goal than to hone my orchid cultivating skills, and perhaps add a few new blooms to my collection! I started indoor rock climbing in the late 1990's. However, since then, I've probably climbed only once or twice a year in the last decade. Since my brother (the flying squirrel) has begun climbing regularly again, I've been inspired to get my act together as well. My goal is to become a regular 5.11a climber from my current 5.10's (climbing difficulty ranks from 5.0 to 5.15). It's going to be tough for this couch potato. Currently I can do zero pullups and one (yes, only one) pushup. I'm going to work on some strength training and yoga to help elevate my game. Staying hydrated is a resolution worthy every new year. It's the key to good skin and a sense of overall well-being. I'm planning to get plenty of use out of my Kleen Kanteen collection and a cute new Kate Spade Thermos I received for Christmas. On a related note, I'm hoping to treat myself to more salt soaks and steam facials as well; these simple water-based treatments do wonders for my skin! I think we all have moments where we're itching for a life change, and all too often the victim is our hair. While a new light and fluffy 'do feels great initially, I inevitably start to pine for longer strands a couple weeks later. It's not that I'm afraid of going short (I had a bob during most of undergrad); I just find that collarbone-or-longer length hair suits my aesthetic a bit better! I have a jam-packed academic schedule (especially this year!) and a tendency to start more projects than I can handle, both in blogging and otherwise. I'd like to focus this year on working diligently, but more importantly leaving no ends untied! There's no reason to miss out on the satisfaction (and the joyful unburdened feeling) of fully completing things. I'm hoping these resolutions will help me lead a richer, more radiant life, which will hopefully reflect itself here on Cute and Mundane! Thanks for reading! Did we have any goals in common for 2014? 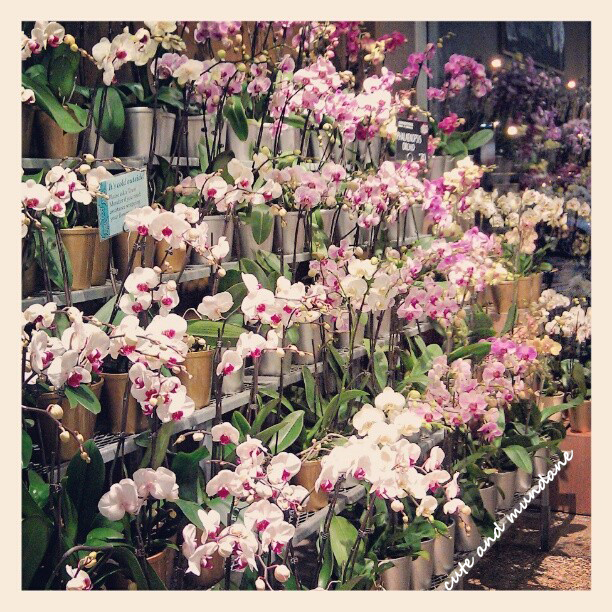 Do you have any orchid cultivation tips? I'd love to hear some of your resolutions this year! I share a lot of these goals :) I love short hair on myself, actually, but I'm trying to grow it out just to try, and I want it to reach an actual, valid length before I cut it off again. I also tend to get distracted on random things and maybe don't follow through with some things, and I do want to finish loose ends, as well. And finally, climbing, yes! I'm more of a boulderer, and I haven't climbed since the summer. I'd like to get back into it (need to find a gym again), and get back up to V4s and V5s. Good luck to both of us!!! 4 is so simple yet so brilliant. I may have to add that to the top of my resolutions since I still don't have enough for a ponytail after last year's life change/hair cut. Thanks for posting this!